With the price of extra baggage these days, who wants to load a rack of dumbbells or plates onto a plane? Instead, use these workouts to build muscle using your own body. Want to get in a good workout but don’t have access to gym equipment? No problem. Using nothing but the weight of your own body, you can work out anytime, anywhere—and have fun in the process. When most people think of bodyweight workouts, they tend to think only of cardiovascular training. For sure, bodyweight workouts are good for this kind of fitness training, but they can also provide great upper- and lower-body strength results. You just need to get a little creative in how you structure them. Since you can’t overload the muscles when using your own weight, you need to find another way to shock them into growing stronger. Here are three workouts that require nothing more than your own body weight and a pull-up bar or doorway. To hit your lower body effectively with bodyweight training, use higher rep exercises with plenty of plyometric conditioning thrown in. 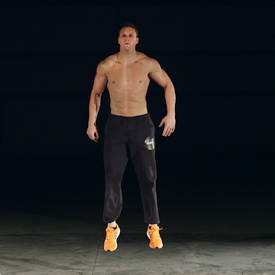 Plyometrics will help build strength and explosive power. When you combine that with some higher rep exercises, you’ll be set to build lean muscle mass. After a brief warmup, complete this circuit one time through, resting only where indicated. After the circuit is finished, rest for three minutes, then repeat a second and third time. The nice thing about lower-body bodyweight workouts is that they can also boost your heart health. One thing you can be sure of is that these sessions will make your heart rate rise! In fact, try this workout only when you are looking for maximum challenge. To hit your upper body with bodyweight exercises, turn to two of the best compound upper-body moves of all time: the push-up and the pull-up. As long as you can find an overhead bar or another object to hold on to, you can easily complete this workout in a hurry. Work your way through the exercises as outlined below, resting for 30-60 seconds between each set. Pyramid the total reps performed downward, until you reach a final state of fatigue. By doing just pull-ups and push-ups, you’ll work every muscle group in your upper body: chest, back, shoulders, biceps, and triceps. You can get in this workout even when short on time. Bodyweight exercises are excellent for increasing your calorie burn during the workout session—and for hours after the session ends. Always start with a brief warmup before doing this workout. Shoot for doing 100 reps of each exercise. Stop and rest when you need to, then start again as soon as you can, maintaining proper form throughout. When you’re finished, take 5-10 minutes to cool down and do some stretching. Modify rest times or reps to meet your needs. You can always jump onto a piece of cardio equipment and do some interval training, but bodyweight exercises are more dynamic, making you change directions with each move you make. This can increase your overall balance and agility levels, and help you build more functional strength you can use in and out of the gym. Plus, bodyweight exercises are fun. Most people get bored with conventional cardio workouts, but there are lots of alternatives for bodyweight exercises to help you keep your mind and your body engaged.